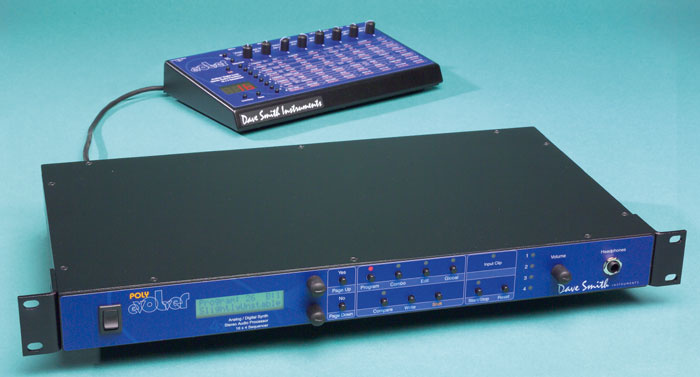 2002 saw the release of the Evolver, a quirky hybrid analogue/digital synth and sequencer from Sequential pioneer Dave Smith. Now he continues his renaissance with a four-voice polyphonic version that integrates neatly with the original. Put simply, the Poly Evolver is four complete Evolvers housed in a 1U rack. It is capable of functioning as a four-voice polyphonic synth, as four discretely addressable monosynths or several combinations in between. Despite its slender design, it crams in individual stereo outputs for each voice, stereo inputs for external signal processing (just one set of these), a stereo mix output for all the voices combined, plus a stereo mix input — whose function I'll come to later. The full complement of MIDI sockets are present — as you'd expect from one of the 'fathers of MIDI' — and power is supplied courtesy of a universal but sadly external PSU. I liked the look of the Poly Evolver's stylish blue front panel, but straight away, I missed the original tabletop Evolver's matrix-like interface of knobs, buttons and LEDs, which were indispensible when programming its sequencer. On the Poly Evolver, a 16-character, two-line LCD provides a window on the built-in editing functions; 11 buttons and just two knobs are on hand to perform all parameter adjustments, and four red LEDs add some visual indication of voice activity. An on-off switch, volume control and headphone socket (not present on the Evolver) round off the front panel. The Poly Evolver's dedicated buttons for Program, Combo and Global modes are joined by Edit, Write and Compare buttons. The latter is a welcome addition, and means you can check the contents of a patch before it is overwritten — something I pined for when writing the previous review. The sequencer Start/Stop and Reset buttons are present as on the original Evolver, as is Shift. If you change patches whilst holding Shift, the sound does not change until you release the button. And if the sequencer is running, releasing Shift instructs the Poly to complete its current sequence before starting the new patch's sequence. 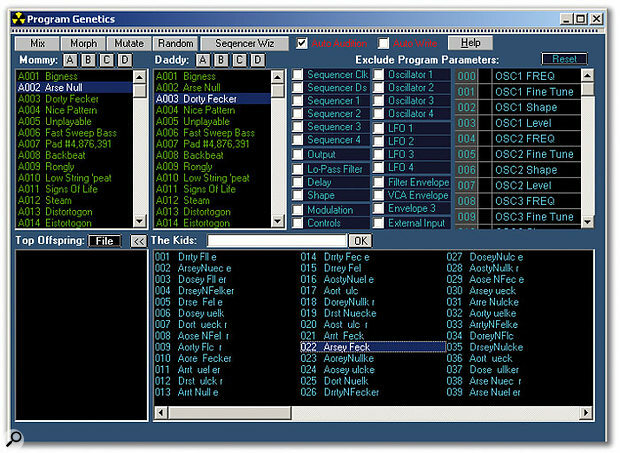 The Sequencer editing screen from the Poly Evolver's software editor/librarian. The values are depicted here as positions on graphical sliders (there's also a bar-graph display option). Below is the sequencer Functions window. Despite the lack of the Evolver's user-friendIier programming interface, navigating the Poly Evolver's OS is not especially painful, and there are a few shortcuts built in to help you get around. When in Program mode, the upper knob selects patches and the bottom knob selects the bank; there are 512 patches in total, arranged into four banks of 128. To edit any of these, you hit the Edit button and then use the Page buttons to step through the top levels of each menu. Once you arrive at the menu you want, the upper knob navigates through the individual menu items, while the lower one is used to adjust values. And to quickly leap to the first or last page within the menu system, you can hold down the two page buttons at the same time. Thus, if you are moving forward using Page Up, keep your finger on that button and press Page Down too, and you will instantly be taken to the last page (Patch Name). This soon felt quite natural, although navigating through the sequencer screens and setting one value at a time remained a bit of a drag. Fortunately, for those who want a faster interface, there are a couple of solutions. The first is to install the free bundled software editor and have all the mysteries of the Poly Evolver revealed on your PC or Mac monitor. The second is of particular interest to those who already own an Evolver, for the manual describes how the Poly can be programmed using the knobs and matrix of the earlier unit. Here's where those Stereo Mix In sockets come into play: they merge the output of your Evolver with the four additional voices provided by the Poly. All you then have to do is connect a controller to the Evolver's MIDI In socket and its MIDI Out to the Poly's Input, set the Evolver to send and receive all MIDI data, and set the appropriately named Poly Chain parameter to 'All', and then any changes you make on the Evolver will be reflected in the Poly. This has the added advantage of creating a five-voice polyphonic synthesizer (now, where might you have encountered one of those before... ?) complete with programmer and screen. It's a pity the Poly's screen does not alter to display the value of the parameter being tweaked, as this would have been a helpful way of translating some of the cryptic abbreviations employed by the original Evolver's three-character display. If your budget will stretch to it, multiple Poly Evolvers can also be hooked up using this method. Both versions of the Evolver were supplied for this review, so I tried connecting them together in this way. I immediately spotted that the output levels of the Poly Evolver were noticeably lower than that of the original Evolver. I rectified this by reducing the level of the Evolver and then boosting the volume of the Poly afterwards, but some kind of global gain adjustment for the Mix Input should probably be added to the Poly in a future OS to make this more straightforward. It's a little curious that the patch names on the Poly are not overwritten if you transmit the current voice or bank from the Evolver to the Poly. Although the synths are able to share voices, the Evolver has no naming facility (it only has a three-character display, after all) and therefore it chooses not to overwrite this aspect of a Poly Evolver patch. It's confusing at first, and when using the two instruments together as a five-voice system, I found it made more sense to start off by loading the patches into the Evolver from the Poly, rather than the other way around. In most respects, an Evolver voice is functionally identical to a voice on the new model. One difference added for the Poly is a key-sync function for the LFOs. As this was not present in the original design, it is a little odd in its implementation. When you set an LFO amount over 100, the LFO resets to zero but with key sync activated. The end result is that, in a polyphonic patch, each LFO can be reset as each voice is played. Polyphony: four voices, each with four oscillators in total (two analogue, two digital). Analogue oscillator waveforms: sawtooth, triangle, saw-triangle, and pulse (with voltage-controllable pulse-width modulation). Digital oscillators: 96 wavetables from the Sequential Prophet VS (128 x 12 bits), and 32 user-loadable wavetables (128 x 16 bits). Synth options: hard sync on the analogue oscillators, FM and ring modulation on the digital oscillators. Filters: two voltage-controlled analogue low-pass filters (one for the left channel, one for the right) switchable between four-pole and two-pole topologies, and dual digital four-pole high-pass filters, which can be positioned before or after the analogue electronics. Amplifiers: analogue VCAs, one for each channel. Audio inputs: stereo, with envelope follower and peak-detection facilities which can be used as mod sources, and to gate and/or step the sequencer. Processing: three-tap sync'able delay, and distortion (one distortion per channel, useable before or after the analogue electronics). Patches: 512 in four Banks of 128, three Banks of 128 multitimbral Combos. Sequencer: analogue-style step sequencer (16 steps in four rows) per voice, with the ability to layer sequences in Combo mode. I/O: separate audio outputs for each voice, stereo mix output, mix input and stereo signal-processing input. I found that patches I'd programmed previously on the Evolver for monophonic play were quite unsuitable, in most case, for polyphonic use. My flabby basses and distorted solos were simply too much, and I realised I needed to begin again, exploring the more delicate, subtle side of this synth. Judging by the style of sounds that have been chosen to populate the Poly Evolver, Mr Smith doesn't dwell too long on delicate or subtle. The personality demonstrated here is unmistakably raw and raunchy; the factory set is brimming with fizz, distortion, harshness and grunge, and numerous mad sequences! However, dotted here and there amongst the collection are some more traditional analogue leads, squelchy brass and even some FM-style electric pianos and pads that work reasonably well within the polyphony limits. With not a great deal of effort on my part, plenty of 'normal' sounds soon spilled forth. Once I'd got into using the bundled software editor (of which more shortly), I created numerous patches with interesting modulation routings, as these are far quicker to set up than via the front panel of the Poly Evolver. Editing Combos with the software editor is, unsurprisingly, much easier than via the Poly Evolver's two-line LCD! With only four notes to play with, I often drafted the Poly Evolver into service as four discrete monosynths. Fortunately, to make voice allocation as flexible as possible, Dave has blessed the Poly Evolver with a 'Combo' mode. Combos allow you to stack voices, address them on separate MIDI channels, produce split keyboards or complex, layered sequences. Don't forget that that each voice has its own delay, sync'ed LFOs and four sequence 'rows', so with four sequencer-based patches running at once, you can generate total insanity from this innocent-looking rack unit. And there are a generous three banks of 128 combos to work with, making 384 in total. As Combo mode allows you to address each of the voices as a separate Evolver, you can opt to process the output of one voice via another. If you insert a lead into one of the individual voice outputs, the signal is disconnected from the main audio output, and if you then connect this to the external input, it becomes available to one or more other voices. Actually, as the stereo audio input is commonly available to all four onboard voices, you could use four separate patches to process an external signal simultaneously, each in a different way, making the Poly Evolver a tempting acquisition for its audio-processing power alone. By way of example, with four patches in hot Combo action, one could serve as a stereo filter bank, another could provide distortion, yet another could step the sequencer according to the audio signal transients and a final patch could introduce delay and tuned feedback. By arranging these patches across zones of the keyboard, you could then select the processing you require by simply playing a key, or keys. The Poly Evolver editor was developed for Dave Smith by SoundTower. I thought its style seemed vaguely familiar — and so it was. These are the guys responsible for the Waldorf Microwave editor that I've encountered in the past. Happily, some of the cooky-but-fun features of that early program are included, such as the ability to draw your own user waveforms, 'genetics' (more on this over the page) and random patch generation. The software also serves as a librarian. Initially, the program took time to get used to. I lost a few patches when attempting to copy an edited patch into different locations until I realised the right-click/paste operation only applies to the currently selected patch. To copy to a new location, first you have to select the patch in that location, then right-clicking will paste correctly. But when you become familiar with the way it works, the editor makes light of otherwise laborious tasks, such as assigning the many modulation sources and destinations. The sequencer editor is perhaps the single most valuable part of the program. With a choice of sliders or bar-graphs, you have a better representation of the four sequencer rows than is possible on either the Evolver or the Poly Evolver's small display. There are also extra features such as a slider to transpose an entire sequence and an (undocumented) Function button that facilitates quick programming of various major/minor sequences, complete with randomise, invert and copy/paste functions. Add to this a 'Sequence Template' facility which can be employed to grab sequence data from any patch and apply it to another, and you'll appreciate why I didn't bother trying to do too much in the way of editing on the synth after a while. Unless you have a predisposition against mousing, I think most people will think similarly. Running a close second in usefulness to sequencer editing, Combos are rendered way easier to work with under the editor than on the synth itself. You can see the patch names used by your four parts, for one thing, rather than just some numbers! A convenient on-screen grouping allows you to alter each part's clock division, transposition, detune, key and velocity ranges, which proved marvellous for managing multiple layered sequences. Oddly, I couldn't rename the current Combo from within the edit window, only from the Combo list, but I got used to this in the end (I let the author of the editor know, though, so this quirk may have been excised by the time you read this). 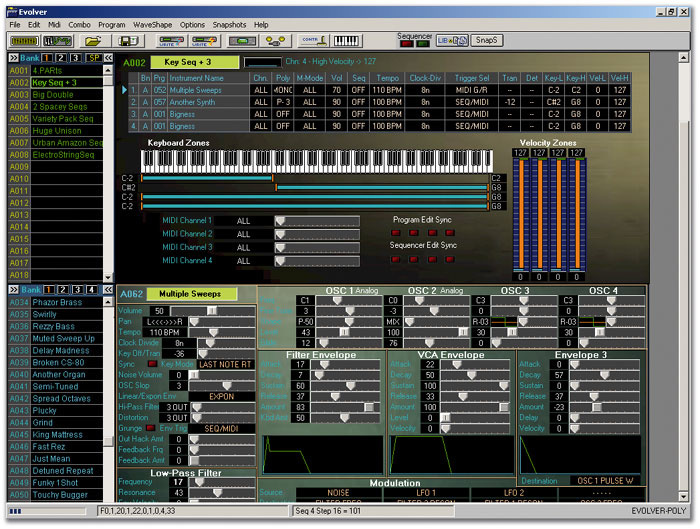 The software even bestows programming options that the synth itself does not, such as the Poly Evolver's 'user wave' facility, accessible only via the editor. Waves 96-128 are user programmable, and I had great fun drawing in waveforms to be auditioned instantly on the Poly Evolver. I'd recommend this to anyone interested in synthesis as a pleasant way to spend a rainy Saturday afternoon. Finally, to delve into some more esoteric aspects of sound design, Genetics is a function that allows you to create 'children' patches from two 'parent' sources, blending characteristics, morphing one patch into another over a series of generations, or randomising them to make a new range of sounds. 'Breeding' and auditioning entire families like this is a powerful and elegant way to create something slightly different. Doctor Moreau never had it this good! Using the 'Genetics' feature to spawn a series of new patches by combining some of the characteristics of two existing ones [nice patch names, Paul — Ed]. I did find a couple of small bugs and duly reported them to the editor's author. One of these was significant, as it affected the editing of the trigger assign modes, but I was impressed to receive a fix less than 24 hours later that resolved the problem. I ran the program on a Windows XP machine, but the system requirements for the editor are quite broad: Windows 95, 98, 2000, ME, XP, with a 133MHz Pentium the minimum spec. The editor also runs under Mac OS X or 8/9. After the original SOS review was published, Dave Smith returned to the Evolver and produced a new operating system with some welcome enhancements for free download from his web site. Here's a quick summary of the most important changes made since the Evolver was first reviewed. Patch total upped to 512 memories with the addition of Bank 4. New modulation destinations added, including individual left and right filter cutoff and resonance, envelope decay and release, and distortion. Synchronous Program changing made possible while the sequencer is running. New sequence modulation destinations added, including clock speed, MIDI note transmission, and MIDI controller transmission. Six new delay sync ratios added, as well as longer envelope rates. New sequencer trigger mode added, whereby a sequence is played once on reception of a MIDI note. The sequencer is the same simple yet versatile implementation seen on the Evolver, although polyphony raises more possibilities in terms of generating polyrhythms and all manner of layered shenanigans. As before, each patch contains a step sequencer with four rows; each of these may be a different length and can control a wide selection of internal parameters. In the later version 2.0 of the Evolver's OS (see the box above), functionality was added so that the sequencers could transmit MIDI notes, plus velocity (although this was restricted to sequence 2, and even then only when sequence 1 was programmed to transmit notes) and controller information. By setting up each sequence row to send notes, you can create layered four-track sequences on external gear. Only the first voice/part can transmit its sequences externally in Combo mode. Also included in the Evolver's v2.0 OS upgrade were two new trigger modes, which permitted the sequencer to be stepped using an external signal or via MIDI notes. As I had been one of those who petitioned for this 'MIDI Sequence Step' mode, I was delighted to see it included, although in the case of the Evolver it was implemented under 'Main parameters' and therefore the settings you choose are common to all patches, which is slightly restrictive. Happily, in the Poly, the trigger modes are available on a per-patch basis for greater flexibility. Perhaps a future Evolver OS upgrade will bring it in line? It's lots of fun programming the sequencer to step through the wave shapes of the digital oscillators, for example, or to vary the pulse width of the analogue oscillators. You can then 'play' the sequencer to generate some unusual Wavestation-like timbres, if you know what you're doing. The Poly Evolver has an impressive 14 triggering options, and it's worth looking at a few of them as an illustration of how deep this deceptively simple-looking box can be. Triggering can occur via MIDI notes or from the sequencer. When triggered by the sequencer, hitting Start plays the sequence on the first voice only, leaving the remaining three available for you. This can be pretty nifty, but it sacrifices the functionality of the original Evolver, where you could transpose the sequence via MIDI input. Fortunately, there are several alternate modes in which a sequence will be started by each keypress, for each voice. For example, the 'MS Once' mode plays the sequence once whenever a new note is received. The sequence always plays through to the end and if you play further notes, the same sequence, transposed, is kicked off in subsequent voices. With care, you can generate some fascinating interacting polyrhythms. Five of the triggering modes are devoted to external signals. In one of these, you can gate envelopes and reset the sequencer, in another an external signal is used to advance the sequencer, and there's even a mode to gate the sequencer using external audio. In this latter case, once the signal gets above a certain threshold, the sequence will play. Based on typical expectations of price and polyphony, I suspect the Poly Evolver will have a harder time establishing itself than the Evolver. Yet, overall, I think it's a good call to bundle four of these beasties together. Anyone who took the plunge and bought an Evolver previously will be rewarded by the ease with which it slots into the Poly Evolver system, adding an extra note of polyphony and serving as a programmer too. I found that editing the Poly Evolver was much faster using the Evolver matrix than using its own screen. However, this may be due to my own familiarity with the original and a general dislike of scrolling through menu pages, especially when each contains just a single parameter. 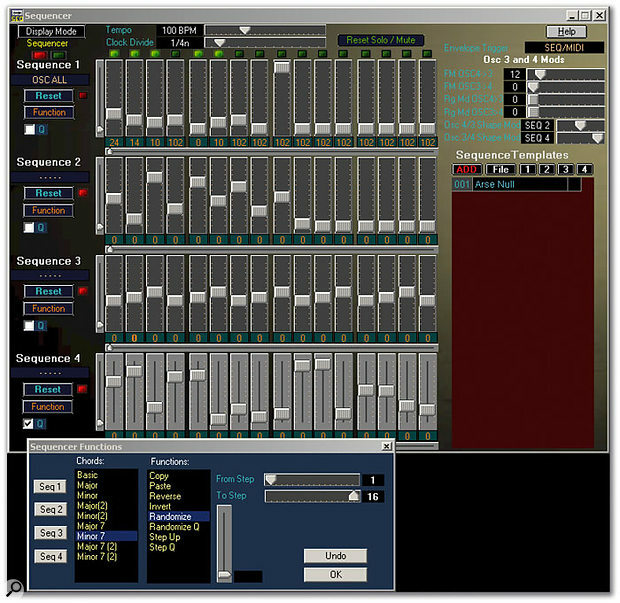 If you bring your computer into the equation, the supplied editor does a great job and is a far superior means of seeing the overall picture — especially when working with the sequencer. I still enjoy the Evolver's characteristic sound. It ranges from punchy bass and snappy percussion to warm, melodious solo patches — or, if you unleash its darker side, it can throw up nastiness or weirdness in abundance. Some might argue that four voices isn't a lot for a modern polysynth, and it's certainly not much when compared to what computer-based plug-ins can offer — even if you take into account that each of the Poly's voices has four oscillators and two filters. But this isn't a virtual instrument, and I don't think Dave Smith sees modelled analogues as his competition. Sometimes it's not how many voices you have that's important, but what you can do with them. To sum up, whether it's used as a sequencer, audio processor, four-voice polysynth or (as I would probably be most inclined myself) four powerful monosynths, the Poly Evolver is a digital/analogue hybrid with plenty of versatility and bags of attitude. Four Evolvers in a convenient rack unit. Integrates with an existing Evolver setup. No means to edit patches within Combo mode. User interface on rack unit not ideal — especially if using the step sequencer. With only four notes of polyphony, the Poly Evolver isn't likely to be the centrepiece of your studio or live rig. But if you want a synthesizer with depth, power and a sound palette that's never going to be dull, I think you'll be pleasantly surprised. The supplied software editor also makes patch and sequence programming fun, and even provides functionality not otherwise available. Poly Evolver, £1100; Evolver £369. Prices include VAT. SSC +44 (0)20 8961 7890.